Attractions, Restaurants, Hotels, Vacation Rentals By Owner, etc. Break away from the same routine and plan your escape to Myrtle Beach South Carolina, find the perfect vacation rental home, oceanfront condo or beach hotel and enjoy the local beaches, activities and attractions. 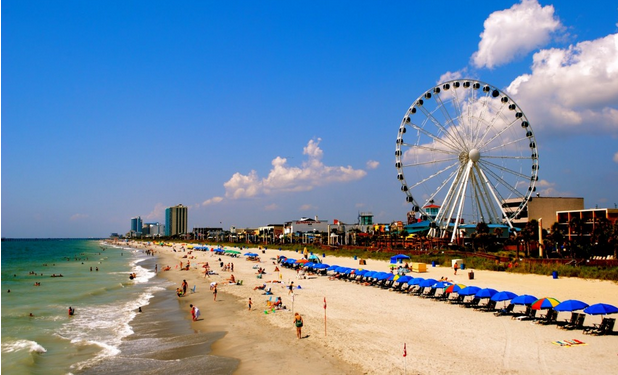 Myrtle Beach SC is situated along the beautiful coast on the Atlantic Ocean and is packed with family attractions, exciting theater shows and endless restaurants serving fresh seafood and much more - no wonder there are over 14 million visitors annually! Myrtle Beach is a spring break destination, golfing destination, retirement community and a popular family beach vacation area. Take in a foot-stomping show at the Carolina Opry, or cheer on your favorite knight at Medieval Times. Mingle with local fishermen of Springmaid Pier, then cool off with some ice cream along the boardwalk. Shop and dine at one of the area’s many outdoor entertainment complexes, or simply explore the beautiful beaches of the Grand Strand. Myrtle Beach is home to an array of waterfront hotels and resorts, as well as oceanfront condos and vacation homes, plus a variety of smaller style motels and inns. Make your plans for a beach getaway and enjoy the best in coastal living with your family and friends.